"Calvin and Hobbes" is a comic strip by Bill Watterson about a boy called Calvin and a tiger called Hobbes. When Calvin looks at Hobbes, he sees a real tiger. However, everyone else sees Hobbes as a toy. This comic began in 1985 and has been in over 2,400 newspapers. Readers bought almost 23 million Calvin and Hobbes books. In the comic, Calvin spends a lot of time with Hobbes. In pictures with only Calvin and Hobbes in them, Hobbes looks like a cartoon tiger. He stands on two legs. In pictures with any other person, Hobbes looks like a stuffed animal. Calvin meets Hobbes in the first story. Calvin catches him with a string and a tuna fish sandwich as bait. Calvin and Hobbes have all sorts of trouble and adventures. The comic strip continued from November 18, 1985 until December 31, 1995. Calvin is a 6-year-old boy. He is named after a religious thinker, or theologian, John Calvin. His last name is never in the comic. Calvin often pretends, and he has a powerful imagination. He also does things without thinking. He is often very excited and is curious about everything. Sometimes he is selfish and rude. 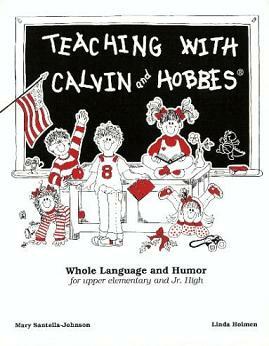 Calvin does not get good grades in school, but he knows very many complex words that usually only adults know. "You know how Einstein got bad grades as a kid?" he says. "Well, mine are even worse!" "Calvin is pretty easy to do because he is outgoing and rambunctious and there's not much of a filter between his brain and his mouth." "I guess he's a little too intelligent for his age. The thing that I really enjoy about him is that he has no sense of restraint, he doesn't have the experience yet to know the things that you shouldn't do." In classic comic tradition of sidekicks, Hobbes is like Calvin's 'good side' because he is more mature and makes smarter decisions than Calvin does. When Calvin does something like throw a snowball at a girl, Hobbes will say "You think she's cute, right?" From most characters' point of view, Hobbes is Calvin's stuffed tiger. However, from Calvin's point of view, Hobbes is as alive and real just like other characters in the comic strip. He is named after 17th century philosopher Thomas Hobbes, who had what Watterson called "a dim view of human nature." Hobbes is much more alert and aware of the bad things that can happen than Calvin is. But, he does not stop Calvin's trouble making. All that he really does is warn him. Calvin will be the one to get in trouble for doing something wrong, not Hobbes. Hobbes also likes to surprise Calvin. He approaches him quietly and then jumping on Calvin. Calvin hates this. Although the first strips clearly show Calvin capturing Hobbes by means of a trap (with tuna fish as the bait), a later comic (August 1, 1989) seems to imply that Hobbes is, in fact, older than Calvin, and has been around with him his whole life. Watterson decided that it was not important to explain how Calvin and Hobbes had first met. Calvin's mom and dad are mostly American middle-class parents; like many other characters in the strip, their relatively realistic and sensible manners act as a contrast to Calvin's childish and selfish behavior. Both parents go through the entire strip without names. They are only called "Mom" and "Dad", or nicknames such as "hon" and "dear." Watterson has never given Calvin's parents names "because as far as the strip is concerned, they are important only as Calvin's mom and dad." This ended up being somewhat problematic when Calvin's Uncle Max was in the strip for a week and could not refer to the parents by name, and was one of the main reasons that Max never reappeared. Sometimes Hobbes does something to attract Susie's romantic attention. He is often successful and this makes Calvin angry and jealous. Although on the surface these events take the form of Hobbes teasing Calvin and showing off his charms, they may be Calvin's way to disguise his own crush on Susie, by pretending that it is Hobbes' crush instead. Moe is a bully, "a six-year-old who shaves" who is always pushing Calvin against walls, forcing to give him to give away his lunch money, and calling him "Twinky." Moe is the only regular character who speaks in an unusual font: his (frequently monosyllabic) dialogue is shown in rough, lower-case letters. Watterson describes Moe as "every jerk I've ever known." And while Moe is not smart, he is, as Calvin puts it, streetwise. That means, as Calvin says, "he knows what street he lives on". Miss Wormwood is Calvin's bored and depressed teacher, named after the apprentice devil in C.S. Lewis's The Screwtape Letters. She continuously wears polka-dotted dresses, and serves like others as a foil to Calvin's rude behavior. Calvin's response to the boring studies of schoolwork is endless dreams of his imagination. She is eagerly waiting to retire, taking a large amount of medication, and is apparently a heavy smoker and alcohol drinker. Although time does change in the Calvin and Hobbes universe, which is mostly seen in the changing of the season, Calvin (and Susie) returns to Ms. Wormwood's first-grade class every fall. As usual, for an adult entering Calvin's world, Miss Wormwood sees things differently from Calvin. For example, when she talks to Calvin about his missing homework, Calvin's Spaceman Spiff persona sees her as a large slimy threatening snarling alien. "Slowly, carefully, Spiff draws his death-ray blaster". Rosalyn is a teenage high school senior student and the person who watches Calvin whenever Calvin's parents go on a night out together. She is the only babysitter able to put up with Calvin's bad behavior, which she uses to demand raises and advance payment from Calvin's desperate parents. She is also, according to Watterson, the only person Calvin truly fears— certainly she is his equal in sneakiness, and is willing to play as dirty as he does. Rosalyn has a habit of sending him to bed at 6:30, which he refuses to do, and only makes more trouble. Rosalyn's boyfriend, Charlie, never appears in the strip, but calls her on the telephone sometimes. Calvin often cuts short these calls. Originally, she was created as a nameless, one-time only character with no plans to appear again; however, Watterson decided he wanted to keep her unique ability to scare Calvin, which led to many more appearances. At one time during the strip shown in the book collection "The Revenge of the Babysat", Calvin's parents prepare to go out on a night with a dinner and a movie while leaving Calvin with Rosalyn. When he finds out she is coming, Calvin runs up to Hobbes and explains the situation. Later when Rosalyn appears, Calvin and Hobbes hear that Rosalyn needs to study for a big science test. They decide to ruin her studying. After Calvin's parents leave, Calvin approaches Rosalyn, curious about what she's doing. After slyly talking her away from her science notes, he quickly grabs them, runs to the bathroom door with Hobbes, and locks the door while Rosalyn yells from he outside demanding her notes back. Once they "flushed" her notes (in which they only pretended to and flushed an empty toilet). Moments later when the wonder if Rosalyn has gone, Calvin opens the door only to find Rosalyn pounce upon him and throw him to bed at 7 o'clock which Hobbes notes that they went to bed 30 minutes later than usual. The ending shows Calvin's parents coming back home to find Rosalyn charge extra money for the job while Calvin's parents argue if there's another babysitter in town. Stupendous man: Calvin imagines himself as a superhero by wearing a cape and mask made by his mom. He imagines other people as villains and he fights them. For example, he calls his mother "Mom-Lady". He calls his teacher "Crab Teacher", and Susie,"Annoying Girl". His babysitter, Rosalyn, is known as "Babysitter Girl". During the winter, Calvin likes to make ugly or frightening snowmen when once Calvin created the "Deranged Mutant Killer Monster Snow Goons". Also, his snowmen creations have had snowmen with missing or multiple heads, snowmen taking another's head for a bowling ball, and snowmen being "knocked over" by his family's car. Also, Calvin frequently throws snowballs at Susie, most likely having himself being chased by Susie. Once Calvin (while in his "Stupendous Man" alter-ego) also made a gigantic snowball and dropped it at Susie while on top of a tree, as where Susie's mom described it as a "the size of a bowling ball". The monsters under the bed are described as scary, octopus-tentacled shaped creatures that lived under Calvin's bed every time he went to sleep. Often, they would try to bribe Calvin to come under the bed by giving him a new toy or by urging Hobbes to push Calvin over in return for a fresh piece of salmon. According to Calvin he'd usually describe them as "all fangs and no brains". They often lie to Calvin when he asks "how many monsters are under my bed?, when they'd usually reply there's "only one" or "none and go to sleep". Although various monsters were known to exist under Calvin's bed, two named monsters "Maurice" and "Winslow" appeared and re-appeared during the strip's middle times. Get Rid Of Slimy Girls is Calvin's anti-girl club. The club's goal is to annoy and bother girls, and Calvin's main target is Susie Derkins. The club has only two members, Calvin and Hobbes. Calvin is "supreme dictator-for-life" and Hobbes is the "first tiger". They two usually make plans like throwing water balloons or snowballs at Susie. Often these plans have a bad ending. However, every time G.R.O.S.S finishes a mission or meeting, they always get awards such as medals, honors, and promotions. Of course, the word "gross" also means disgusting. 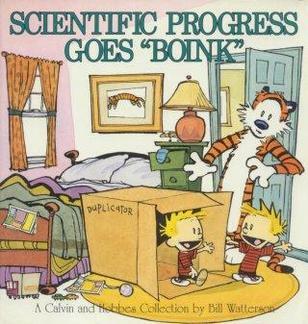 1991: Scientific Progress Goes "Boink"
Calvin and Hobbes Facts for Kids. Kiddle Encyclopedia.